You may or may not be amazed to find that the programmable thermostat and remote management options are ridiculously weak. We literally had thermostats from Bayweb on order, when we saw an article about Nest thermostats. There is little that I can write that hasn't already been said by the authorities: NYTimes, David Pogue, Macworld. It works, as it should, right out of the box, no instructions needed. It took about 10 minutes to install (thwarted only by the depth of the sheet rock before I hit a solid joist in the marriage wall). These photos leave a bit to be desired, it was 630am and my 16 month-old helper was buzzing around my feet. After turning the power back on, I connected to our wireless internet connection and the unit self-updated. It then backed itself up. It asks for your zip code. A long article on the trials and tribulations of prefab building is yet to come. Only thing I can say with definitive clarity is steer far clear of the factory Penn Lyon Homes. (update 3.21.11: just learned Pennlyon was purchased) Our contact there, Ben Burns lied to us, misled us, missed every deadline that was set, was one of the most unprofessional business people I've dealt with. On top of that, we are now 10 months from setting the house and they still haven't paid the set crew. They owe us countless thousands of dollars for errors, ommissions and ridiculous mistakes (some of them not even to code). But all that aside, Hidden Valley Construction, our on-site builders, did a fantastic job and made up for and fixed all of Penn Lyon's shortcomings. The basic timeline from setting the house to sleeping in it was just over three months. It is quite possible that the next time we visit, we'll be staying the night. That will be a momentous occasion, I'll try not to jinx it (it's two weeks away). Week 9 saw the deck closer to completion. The upstairs bathroom is 98% complete. The kitchen is pretty close. The downstairs bath is started. The floor is mostly in! Looks great, we were not 100% sure about the look of the Cork Floor we bought, it has a much larger grain than we expected. But, it settles into the space nicely and the panel seams disappear well. We still haven't nailed down an under-bench light solution, so currently it is run to junction boxes. We'll post a more complete update soon, but the bathroom tile is going in and the porches are being framed up. The septic has finally been finished. The radiant heat is still radiating gloriously. The cork floor has been delivered (not installed). The ikea kitchen has been delivered (not installed). The first floor bathroom was just leveled and the floor tiled. The basement has been sheet rocked. The back-up heat system (a long story) has been installed and ventilation run around the basement perimeter (see photos below). And at long last, the siding has been completed. It looks great. 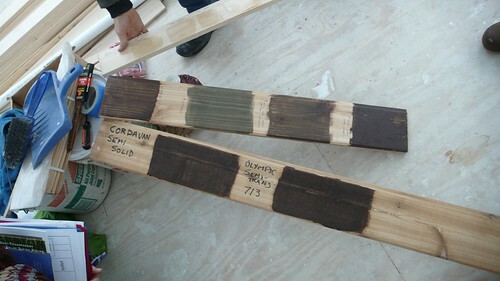 The vertical tongue-in-groove rough cedar planks were all stained in the basement and dried before going up on the house. Take a look at the slideshow below. The window returns are finished, they look fantastic. We're really happy we kept fighting for that (yes there was some resistance). This weekend we went over interior and exterior stain with Andy and Alissa. It's going to be the Cordovan semi-solid. You can see the deck pier moldings poking out of the snow. Those haven't been poured yet. It's been a bit cold. Hopefully in the next week. All the utilities are finally hooked up, but despite the septic field having been prepped 4 months ago, it still isn't complete. So the water isn't hooked up yet. Hopefully the septic goes in this week as well. Andy and the crew tackled some interior work for the first week. Framing out the walls in the basement, and tackling the light scoop interior. The only heat source currently in the house is the wood burning stove. 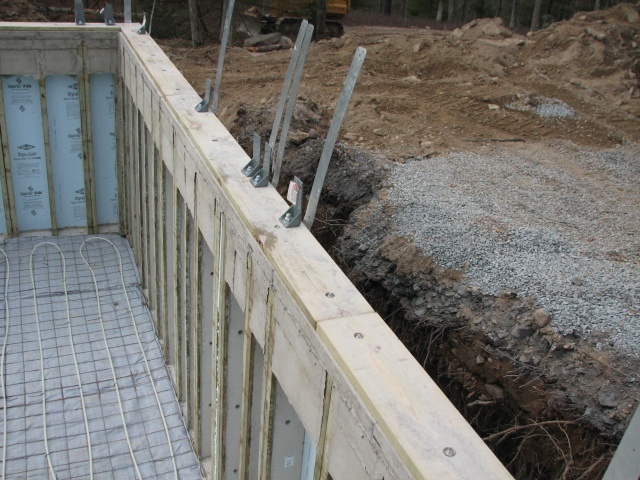 The pipes you see in the opening beside the foundation are our Geothermal temperature regulating system. It's sort of a homemade system that Walt recommended. The system consists of an intake and outflow pipes in the basement (second picture below). These openings feed a series of buried pvc pipes which condition the air by regulating it to the ground temperature, a very stable 50 - 60 degrees year-round. We'll post an update when we've had a chance to use it. Music: Mogwai "Ratts of the Capital" from the album Happy Songs for Happy People. On Friday 4 December 2009, the Villa Straylight was delivered. Not without a few hiccups (I'll elaborate later) but now a house exists. Here's a raw time lapse video of the house being set, I'm choosing my favorite audio track, the rock mashup, I also made a Dub version and a Classical version for your enjoyment. This time-lapse was shot on a Canon EOS Digital Rebel, using an intervalometer shooting one frame every 5 seconds. We started shooting at 8:30a - 4:45pm. The original material is 1936 x 1288. This was crunched to 726 x 483, using h264 codec out of FCP. The house was on three trailers. 1 @ 14' x 36', 1 @ 12' x 36' and one with the light scoop and parapet walls to be finished on site. You can see the crane stack the trailers as each one is finshed. Also, here's a 150 still images, unedited, as a flickr slideshow. The two halves of the house were delivered today, to be set on the foundation tomorrow. Friday the 13th, of November 2009. The foundation continues. 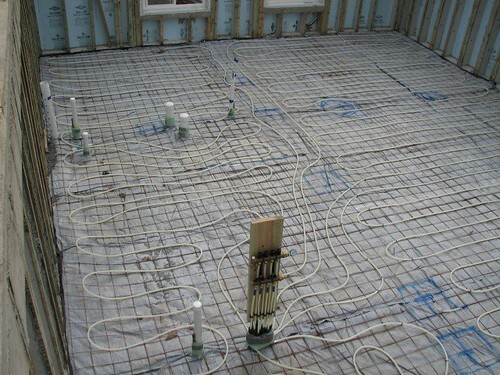 This week saw the foundation sealed and plumbing and radiant heat coils added. Pictured below are an addition to the Superior Walls. These are Simpson Tie Downs. These were required because of structural issues with the large amount of window to wall dimensions. Instead of the regular tiedowns (the taller metal straps) we had the 'Simpson' style tie-downs manufactured (smaller metal footer items) and per the State review and the engineer we added 29 of these around the perimiter of the foundation walls. It has been an unnecessarily long and drawn out year of trying to get this house built. We've waded through countless bids and considered every route from stick built to various levels of prefabrication. The gory details can wait until it is finished, but at long last it is moving forward - with a functional plan and people in place to get the job done. 2. Factory and Prefab coordination and consulting by Walter Bestwick. 3. 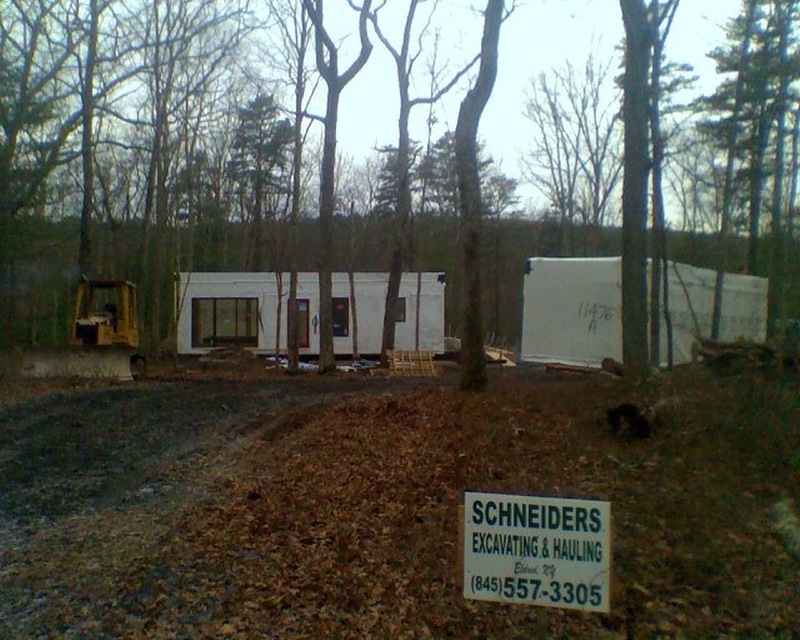 Prefab Foundation by Superior Walls. We found this stove at Lowes that is a close enough match and going to the one. In doing research on stoves we have been in a bit of a quandary because honestly they are all so ugly. Especially the pellet stoves which seem to be especially awkward. There was one model of pellet stove we found that we liked but of course it is only available in Japan. Then we found a wood burning stove that looks good, a blend of classic old-fashioned with clean lines and slightly industrial. High-efficiency airtight stove heats up to 1200 sq. ft., with a maximum output of 28,337 BTU with Douglas fir, and 68,000 BTU with hardwood. Heavy-duty 3/16in. steel plate construction and fully firebrick lined. Features secondary air reburn combustion system, a cast iron feed-door with gasket, clear-view air-washed ceramic glass, cam-lock latch and cool-touch spring handle. Stove accepts logs 18in. long. One full load burns approx. 8-10 hours. Safety tested to UL 1482. Then there is the problem of fuel. The reason we have been looking at pellet stoves is because they use electricity to burn sawdust pellets, so it can be a carbon neutral form of heat. We really want a stove though. Compressed sawdust heat logs look like they might be good solution. They are also made from waste sawdust and burn much cleaner than firewood. And we could also use them outside in a fire pit, too. So maybe we can have the stove we want without burning trees. Win-win. We forgot to mention that the reason we are looking at color palettes is because we are thinking of painting each interior door a different solid color. The front door will be red (it's glass so the frame will be red) and the doors to the bathroom, basement, guest bedroom and our bedroom we have yet to decide on. Nate mentioned that a red door is something of a Rapson signature and we think it would look great. Our friend Nadia suggested that we take a look at this book for inspiration. And to say it is inspiring is an understatement. The houses in this book not only reflect our aesthetics perfectly but also embody the idea of how we want the house to function; a place to get away, slow down, enjoy the surrounding nature, and plain relax with friends and family. We were also surprised to find that the houses were almost all named "Villa" something or other. Since we found the name for our house in a science fiction novel it seems to be a strange coincidence! We would of course need some storage in there too, but I think we want to go with furniture for that rather than built-in. Like a narrow credenza/shelf or bench along the one wall between the doors, something wooden. We could do subway tile floor to ceiling and we'd use it for the base of the tub as well. The tub is an extra deep, round, Japanese-style soaking tub. The shower wouldn't be enclosed with a curtain or anything, sort of an open space with a shallow floor to ceiling wall next to the door. As things get further along, we need to start thinking about details like finishing and hardware. It seems unwise to try to build a new house without thinking of ways to make it both more efficient and more carbon neutral (trendy but true). Which means among other things, we are going to look into the possibility of solar energy for the Villa Straylight. It turns out that in New York there is currently a program that will offset a large percentage of the cost of installing new a new solar system, around 40% according to their government website.These incentives last through 2009 so hopefully we will be able to take advantage of them. Since we will most likely want to do a grid-connected system, we will be able to put power into the grid instead of just taking it out. Just reading this article on the pleasures of the outdoor showers in the New York Times. One word: ahhhhhhh! After a little bit of research online to find out what kind of rocks are laying about all over our land, we discovered what we have is an abundance of Pennsylvania Bluestone. We are choosing to look at this as a good thing as we can use the stone to build our patio and a stone walkway inside the house. What we don't know is if this will be a problem in excavating the basement. There are a LOT of rocks. Hopefully there isn't a gigantic bolder right under our house site. Random history note: The Starrucca Viaduct (below) is a bridge built in 1848 made of bluestone that carries the Erie railroad across the Starrucca Creek in Pennsylvania. It's been in service for over 150 years. Built to last! The Villa Straylight is becoming more of a reality every day. We have been working with Rapson Architects and Wieler Homes to put this project together and so far everything has been moving right along. We have been getting a steady stream of plans from Toby Rapson (whom Stevie had the pleasure to meet in person in Minneapolis last week) and as they get more specific we get more excited. Nate Wieler is in the process right now of looking for a factory that is New York certified to prefabricate the building. A couple of nifty details have been working their way into the plan. First, is the idea of building the house with two different ceiling heights connected by an atrium with a set of clerestory windows that runs down the middle of the house. Along with some dramatic added height, it will also catch morning light from the East. And the second amazing detail is a stone walkway inside, beneath the atrium, made up of Bluestone rocks that are found in abundance all over our land. Might as well use what you have! The house will be roughly 1000sq ft with an added 1000 sqft full-height basement. On the main floor, we'll have two bedrooms, kitchen, living room, bathroom and outdoor shower. The basement we are going to leave unfinished for the time being. To read more about Ralph Rapson and his legacy visit Rapson Architects. Where do you put this thing? In a spurt of renewed energy regarding the Villa Straylight, we drafted up a site plan with the house on it approximately to scale. The result was totally shocking because I think we had been picturing the house bigger and the lot smaller. We checked the math on our rendering and the scale on the lot map over and over and it's right, we were wrong. I think the next time we go up there we need to bring some long twine and some stakes to help us visualize the size of the building on the lot. The green part is the house, the yellow line is a possible driveway, the blue square is a stone patio. We read an article about this house in upstate New York in Elle DÃ©cor the other day and found all of it very inspiring. Doing things backwards, we bought Jill Greenberg's bear photo for a wall that has yet to be built. And when we purchased it clampart also gave us a copy of the very excellent companion book of her Ursine photos. I guess we have to remember to never invite Stephen Colbert over. We are officially land owners. We went up to Port Jervis to meet with the lawyers and a woman form the title company to finish the paperwork and hand over the check. Now the real work begins. Everyone is jumping on the prefab band wagon! Design Within Reach has a nice little 9'x13' studio that could function as detached office/extra bedroom at a future date. It comes as "kit" with instructions to assemble it yourself on-site. Trees and Quiet from winkink on Vimeo. Delaware River Road from winkink on Vimeo. Exciting news. Our offer was accepted by the sellers and we have signed the contract and put it in the mail to the lawyers. Which means we are getting very close to closing. We need to attend a meeting at the Black Forest Colony with the home owner's board on February 17th before we are allowed to close on the land. Six acres of wooded wonderland! Along with putting in a septic system, we will also need to have a well on the property. This is another area in which we will need to do some research since we know next to nothing about wells. We found the a site called wellowner.org which is a consumer information site that should hopefully help get us up to speed. There is certified local contractor finder on the site which could be useful. We think one way we can get the most out of our little house will be to have a full basement. We can store all the stuff that doesn't fit in our apartment in the city, outdoor furniture during the winter and possibly an even put in an extra bedroom. And what better way to go than a prefab foundation? We are investigating Superior Walls as an option for the foundation. Zach's mom used this type of foundation for her place in Colorado. She said it was fantastic. No guesses yet as to how much it will cost to dig a basement, or to buy the prefab foundation. We will update when we find out more. We are pretty sure that we will have to access the basement from the outside since there is no place for stairs inside the weeHouse. But we will be researching that possibility as well. And why prefab? There are many reasons why this type of building is possibly the only way we can make our dream of a little place in the woods a reality. We both work more than full time, live in Manhattan and don't have time to oversee the construction of a site built house. Having the house delivered already built will make the fact that we can't be at the construction site everyday during the process much easier. Prefab houses are built in a factory so there is less waste than a site built house; extra materials can be used for other projects. And they are manufactured in a climate controlled environment so you don't have to worry about weather delaying construction. WeeHouses are pre-designed so you don't have to pay an architect to design the house. Modern houses like the ones we are interested in would be expensive to have designed from scratch. And we are told the cost is 20% cheaper than a site built home, around $125-200 sq/ft. We also dig that the weeHouses come standard with bamboo flooring and Ikea cabinets, practical options we would have picked ourselves. It may be early to be decorating the walls of our imaginary Villa Straylight, but we found the perfect piece of art; this bear from Jill Greenberg's Ursine series. We've been huge fans of her work for a while now, the hilarious and surprising monkey portraits and the controversial crying children. But the idea of taking the bear out to the woods seems perfect. The lot on which we will be building is not on a sewer system so we will need to build a septic system. This is very common in rural areas where the houses are spread out and far away from the city center or in areas where the landscape is too extreme for conventional sewers. We are now in the process of educating ourselves on how septic sytems work. We are pretty sure we will have to do another perc test before we can get a permit to build on our land. The last one was done about two years ago, we think, and the test only lasts for two years. We still have a lot to learn about how it all this stuff goes down. The real estate agent also mentioned that according to the perc test, we will most likely have to build a "mound" type of septic system. Again we still have more research to do, experts to consult and tests to preform on the land before we will know for sure. So the hopes and dreams for this car were dashed on the rocks of a bad Craig's List purchase (probably a stolen vehicle anyway). The volvo died, after one mechanic put a few hundred dollars worth of fictional work into it and another literally said, "pick it up before it gets a ticket." The next shop wouldn't even fix it, they said ditch it. Ok we got our money's worth, but the worst part was, after donating it to Habitat For Humanity, a charity, they racked up $250 worth of parking tickets. We tried for months to get them cleared to no avail. Proving yet again that no good deed goes unpunished. Shame on you NY City and shame on you Habitat For Humanity. We're now rolling in my late-grandmother's 2003 Ford Explorer. Thank you Elizabeth. We've dubbed it the QE3 - the next name in succession after one of her favorite nautical vessels. In order to get to the Villa Straylight, we needed a car. We found one on Craig's list that sounded too good to be true. And even though it's a little early in the game to get a car, we couldn't pass it up. Our 1994 Volvo 850 Wagon is the perfect old car to use in the country. Although there are lots of miles on this one, everyone says Volvos last forever so we are crossing our fingers that this one will last a bit longer. Our original plan was to park our car at the Port Jervis train station and drive the 20 minutes to the Black Forest Colony. At only $192/year this seemed like the way to go. But we just found out that the station's yearly permit parking is only for 16 hours, not 24, which is putting a bit of a hitch in the plan. I am pretty sure we will be able to figure a way around it though. Having a car in the city is way too expensive and driving out on weekends would be too stressful anyway. We stumbled upon what looks to be a brief history of the Black Forest Colony online. It might be a rough draft since there was a little note at the end that said "Check for historical accuracy?" To get the daily station-to-station train schedule, visit the New Jersey Transit website and choose Penn Station to Port Jervis. There is one transfer at Seacacus (one stop from Penn Station). The Port Jervis station is the end of the line. Trip will be about 2hrs 15min to 2hrs 45min. We have decided to focus mostly on the weeHouse for the Villa Straylight. The model we are looking at is the "large" model below. 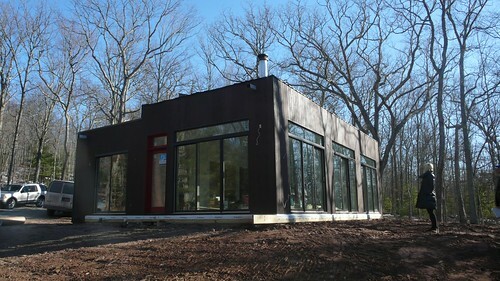 All things considered, a prefab home will be the way to go for our Villa Straylight. We love the weeHouse the best, it satisfies all of our requirements. But we are still exploring all the options out there just in case the weeHouse doesn't work out for some reason. Fabprefab seems to be the place to go for extensive information on prefabs from all over the world. We took a trip to look at all the different lots for sale at the Black Forest Colony. The name "Villa Straylight" comes from a fictional house in William Gibson's book Neuromancer. It is the home of the Tessier-Ashpool family who appear in the Sprawl trilogy novels. The family owns Freeside, a space station shaped like a spindle constructed in high orbit. The family resides in the Villa Straylight, which occupies one end of the spindle.